Usually when you wake, your vibes are at their highest and it’s pretty easy to set intentions and make positive affirmations. This is definitely the time to do the work and will yield your best results. However, as the day proceeds, and your activities and others have your focus, you might find your vibes shifting into the not so good-feeling direction. As Master Creators, recognizing and being sensitive to these feelings are your ticket to living your best life. 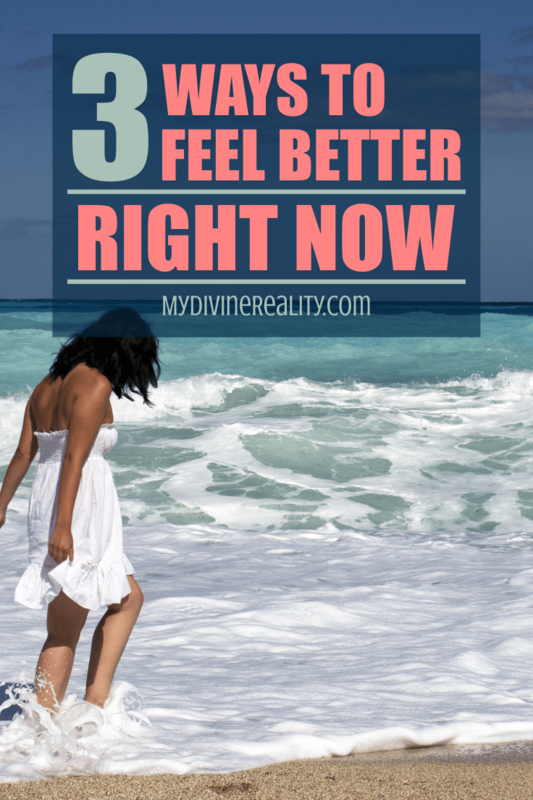 If you find yourself getting into the midday funk, try these 3 ways to feel better right now! Your breath is your greatest connection to Source. When you are focusing on your breath, doing it deeply and with intent, you naturally raise your vibes to meet that of your inner being. You can’t focus on your breath and think a thought…. so its like a mini meditation that can swiftly tune you in. Take 5 to 10 deep breaths and feel the energy return! Your body is like a battery. It needs water to conduct the energy that is flowing thru you at all times. The more water in your cells the better the energy flows. Sometimes, we don’t even realize we are thirsty until we drink the glass of water…. the headache disappears, the anxiety wanes and a sense of well being overwhelms your body. Grab a glass of water and light up your cells. No matter what, all is well and everything always works out in my favor. And when you really start to settle into that knowing, your point of attraction immediately shifts and you see the bigger picture. Choose a statement that gives you a physical feeling of relief and repeat it to yourself 3 times. Comment below and share your favorite go-to statement that helps you feel better! We know you feel better already! We do too! Always remember, nothing serious is going on here…. and have fun with the unfolding of life! It all really is working out for you! Click here to read 5 Simple Ways to Stop Worrying.